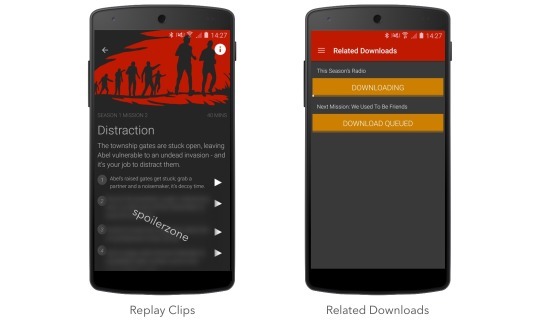 Listen Again & Resumable Races on Android – Zombies, Run! Related Downloads: If there are downloads related to your current mission, like radio mode or the next mission, you’ll see a little download icon next to the ‘Start Mission’ button. This’ll let you easily get any related downloads. Listen Again: Missed part of a mission clip? Want to listen again to your favourite moments? You can now play any unlocked mission clip – just tap on the ‘i’ icon on a mission screen. Better GPS Tracking: If you have GPS tracking enabled, we’ll now start pinpointing your location as soon as you get to the mission screen. This means we can start accurately tracking your run route faster than ever. UI Improvements: A new typeface for clarity, improved Mission Details screen, and a lovely new splash screen on startup. Resumable Race Missions: Essential for the 20k missions! Bug Fixes: Better memory management to help performance on lower-spec phones. Grab the latest update now on Google Play!